Scaffolds, play a major role in whether end users can begin their work on schedule. We meticulously build our scaffold schedule, supplemented by detailed performance metrics, to ensure end-users will find the scaffold safely constructed, matching the expected functionality, and ready when promised in the schedule. APTIM has been erecting towers of all shapes and sizes for more than 30 years. Our clients include power houses, refineries, chemical plants, sea walls, pressure vessels, buildings, and even shipyards. Whether tube and clamp, cup-lock, mason-frame, or swing-stage, we build, modify, and dismantle all types of systems. 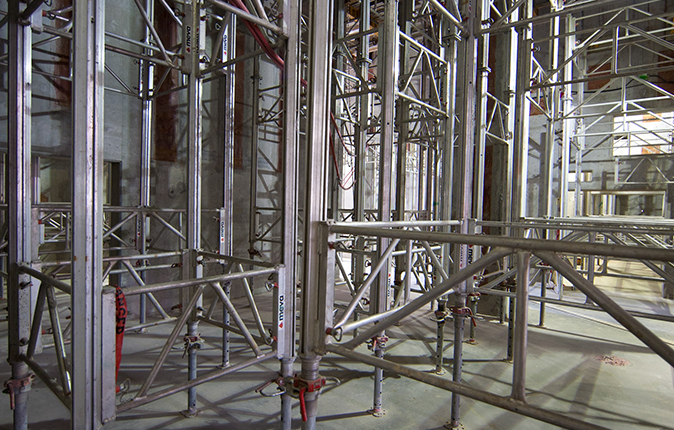 Prior to erection each scaffold is walked down for conditions and then estimated for required material, labor resources, and schedule duration, all of which are input into our proprietary scaffold-management database tool called ScaffTrak. ScaffTrak, which can be integrated, real time, with most client work-management systems and project schedules (e.g., Primavera), is the cornerstone of our process that allows scaffolds to be tracked from cradle to grave while preserving key data, including BOM, and actual hours to erect/dismantle.